Household workers work in the private homes of their employers, performing tasks such as in-home child, patient, and elder care, housework, and cooking. Mujeres Unidas y Activas and the Day Labor Program Women's Collective of La Raza Centro Legal came together to analyze and to strategize to improve the household work industry. 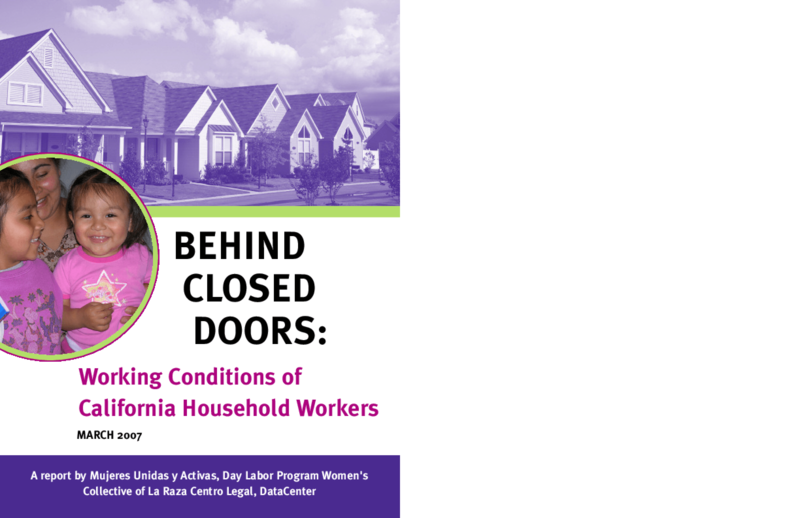 Because there is no accurate data available about the number of household workers or information about their work conditions in California, these Bay Area organizations of low-income immigrant Latina women, many of whom are household workers, joined with the DataCenter to create a participatory research project to assess the industry. The research shows that household workers are primarily female immigrants. While supporting their employers' homes and families, findings show household workers are working in substandard and often exploitative conditions, earning poverty wages too low to support their own families, and lacking access to basic health care. Copyright 2007 DataCenter. All rights reserved.